Which software would you choose for performing a single habitual task knowing exactly what you want to get as the result? Would you be looking for a complex, versatile, multi-functional application with hundreds of options to choose from? That's quite improbable. You would rather have a compact tool that would do the job quickly, efficiently and with a bare minimum of input from you, which is a natural desire. Fortunately, despite the abundance of MP3 encoding programs on the market, there are some that can still surprise you. If you are looking for an ultra-fast, compact and affordable MP3 encoder that will save your time and always demonstrate excellent results, check out MP3 Converter! An unusually efficient and easy-to-use application with an unusual name, MP3 Converter allows you to convert your music and videos in virtually any popular format - WAV, WMA, ASF, RA, RM, VQF, CDA, OGG, AVI, WMV, MOV, 3GP, MP4, FLV, RMVB, VOB, DAT, MPEG, VCD, DVD and others — into MP3. It even supports YouTube videos, so you can convert them to MP3 and then play them on your iPod, iPhone, PSP or cell phone. The process is extremely simple. Set the encoding options (bitrate, rate, number of channels), specify the output path and then simply drag and drop one or several music files onto the drop area of the application. That's it! You can now go make yourself a cup of coffee or lean back and watch MP3 Converter process your files! 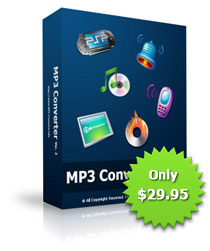 MP3 Converter is affordable, compact, fun to use and, most importantly, it does usual things in an unusual way. Check it out and you'll soon find out that it's true!